Definition at line 65 of file cursoricon.h. Definition at line 73 of file cursoricon.h. 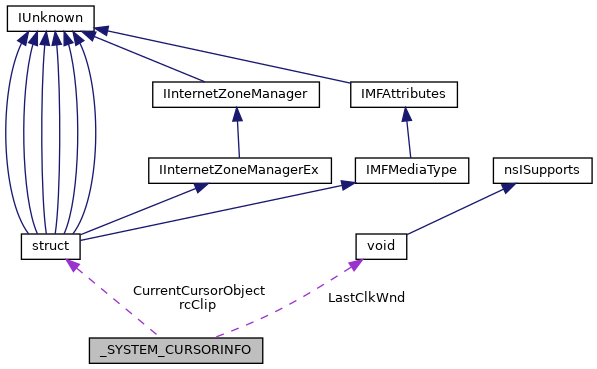 Referenced by InitCursorImpl(), NtUserGetClipCursor(), UserClipCursor(), and UserSetCursorPos(). Definition at line 71 of file cursoricon.h. Referenced by InitCursorImpl(), UserGetMouseButtonsState(), and UserSendMouseInput(). Definition at line 68 of file cursoricon.h. Referenced by co_IntProcessMouseMessage(), and InitCursorImpl(). Definition at line 69 of file cursoricon.h. Definition at line 74 of file cursoricon.h. Referenced by co_MsqInsertMouseMessage(), InitCursorImpl(), MsqCleanupMessageQueue(), NtUserGetCursorInfo(), and UserSetCursor(). Definition at line 67 of file cursoricon.h. Definition at line 90 of file cursoricon.h. Definition at line 91 of file cursoricon.h. Definition at line 92 of file cursoricon.h. Definition at line 93 of file cursoricon.h. Definition at line 72 of file cursoricon.h. Referenced by NtUserGetClipCursor(), UserClipCursor(), and UserSetCursorPos(). Definition at line 94 of file cursoricon.h. Definition at line 75 of file cursoricon.h. Referenced by co_MsqInsertMouseMessage(), InitCursorImpl(), NtUserGetCursorInfo(), and UserShowCursor().